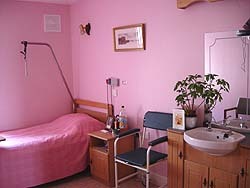 tastefully designed bedrooms with wash hand basins, vanity units, phone & T.V. points and all bedrooms overlook the beautiful gardens. Nurse call facilities are installed in every room in the house and there are hand rails in the corridors for walking and exercising. Residents can enjoy the sun lounge or the conservatory with panoramic views of the gardens and surrounding countryside with choice of relaxing in the reading room, smoke room, a quiet room, or two elegant lounges.